Rogue-like space scavanging game using C++ and SDL2 on my own engine. I didn't get arround to scavanging, or any complexity in the enemies. Or fixing a couple of engine bugs & shortcomings, such as sprites sometimes not being removed from the screen, as well as leaks associated with removing PhysicsObject/glue/RenderedObject "combos". These things will probably only take a couple hours, but I already spent a lot of time improving the engine during this gamejam. I hope my next gamejam won't have as many engine issues as this one. 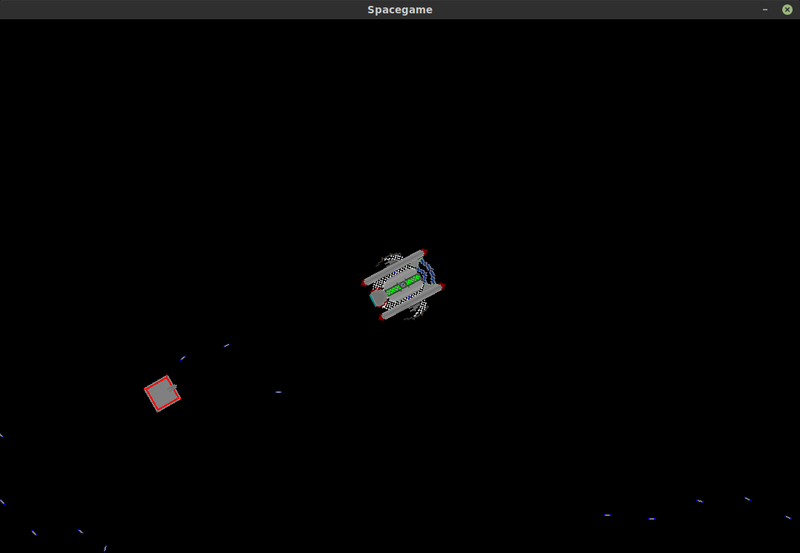 Using my own engine that I had partially done before the gamejam(no game code, just pure engine). Spent a day (+several hours) just fixing the engine. Enemys will spawn randomly arround the starting area. Pressing p will spawn an enemy. Touching a bullet kills you. Enemys die if they touch a bullet. I didn't get arround to all I had planned, but one of my days was just engine development. 32-bit x86 Linux - Install SDL2, SDL2_ttf , SDL2_image , and cmake , and build using the BUILD.sh script then run as usual.